A strange film with no discernible story-line, although the blurb on the back of the DVD box would have you believe it’s about a team of Second World War commandos attempting to save some kidnapped generals. 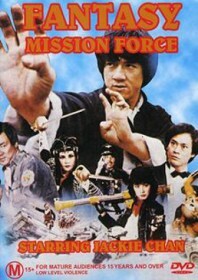 But here’s what we’ve actually got: Jackie Chan hitting a fat wrestler over the head with an iron shield; a young Brigitte Lin in outrageous clothing blowing up buildings with a fluorescent bazooka; a tribe of Chinese Scots playing bagpipes in a Benny Hill style; and a big smack-down finale at a Nazi garage. Let’s not forget the tribe of Amazonian women who float on water and wave big scarves around. There’s far too much going on here, and we haven’t even mentioned the musical numbers. This film should be sectioned. Studio: Cheung Ming Film Co.